Enjoy teamwork, communication, and creative thinking skills. And a whole array of strategic fun. These activities are currently available in the Costa Del Sol area of Spain, including Malaga, Marbella, Torremolinos, Estapona and more. Do talk to us about your preferred location. A series of team building exercises composed of several challenges which focus on encouraging bonding. Your group will be split into teams by our friendly, professional, multi-lingual workshop leaders. Teams will then be pitched into a series of strategic challenges, some which are rather tough challenges, others... less so. All will require leadership and communication to enable teams to succeed. An outline to the games are listed below. We can help you can find the right ones to fit your space (the activities work indoors or outdoors), your goals and your available time. 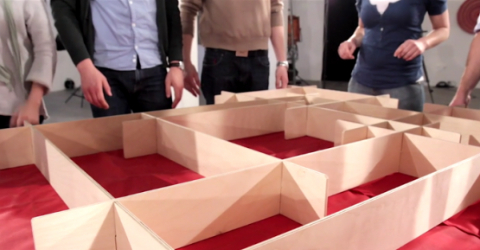 ​​The Maze, Blind Box, Control Tower, Tangram - Brain Teaser, Smart Puzzle, Spider Web and Giant Jenga, among others. We can help provide refreshments, or a delicious Spanish-style lunch, to suit your requirements. Do contact us for further information. ​Exercises critical thinking, communication skills, teamwork, 'thinking outside the box' problem solving... and some excellent fun thrown in for good measure. This activity takes approximately 1 - 3 hours, depending on your choice activities. Our price includes the activities, helpful staff/monitors and all equipment and materials. We can happily accommodate small or large corporate groups. Groups are divided into teams of 6 to 10 people, as suits.